Clark Stationery - Dabney Lee - Acute Coasters. Go to Ivy + Anchor for all designs and monogram/color options. Item Name: Acute Coasters. Go to Ivy + Anchor for all designs and monogram/color options. Description: Your martini or coffee cup never looked better than on these monogrammed coasters! Add style to your next cocktail party or gathering with these fabulous new paper coasters. They measure 4" x 4" and come with a clear lucite box. A set includes 125 coasters with your choice of style swatch, monogram type, and monogram color. Great for yourself or as a hostess gift. 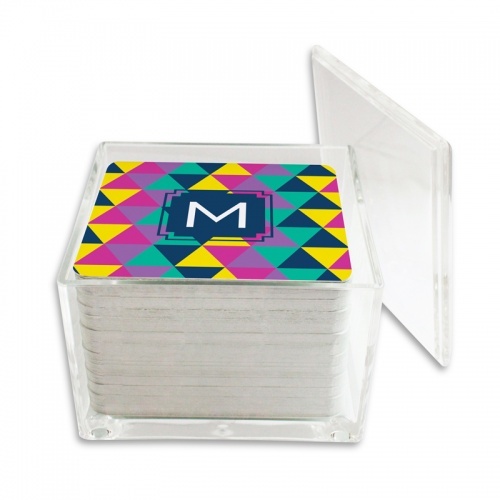 Coasters are made of lightweight cardstock with a glossy finish and are meant to be thrown away after your party for easy clean up. Click here Ivy + Anchor for all designs and monogram/color options.